Eleven wars to lose it, one bridge to somehow get it back, A Turning Torso and Chicaco in the 1930’s. Does that make you curious? Well read on, and find out what that’s all about. We take a historical look at Malmö, the host city of the 2013 Eurovision Song Contest. Malmö was once the second largest town in Denmark, but the country lost it in 1658 after a series of wars between Denmark and Sweden. The state of wars between the two country’s started after the end of the Kalmer Union in 1523 and lasted, with periods of peace, until 1814. It was all about money as, as long as he controlled both sides of Øresund, the king of Denmark could tax the ships that sailed there. In the beginning Denmark defended the region rater successful, but in the 1620’s Sweden reformed their administration and tax system, an operation led by Axel Oxenstierna, which made it possible for them to build a professional army and becoming a major player of the European theater of war for the next hundred years. After the signing of the peace treaty in Roskilde in 1658 Denmark lost the province of Skåne where Malmö was located and still is the main city. For a short time hope of peace between Denmark and Sweden broke out, but only one year later Sweden crossed the Øresund in the attempt to this time to capture Denmark completely, but their hopes was destroyed in the Battle for Copenhagen where the Swedish army was completely defeated by a mix of Danish soldiers and volunteers. All in all Denmark and Sweden were at war 11 times, inconceivable today, now there is a lovely bridge crossing the Øresund linking the two great country’s together. The city we now call Malmö was mentioned for the first time in the year 1200 under the name Malmhauge, it got its code of Arms in 1437 by Erik af Pommeren, who was blood related to the Danish Queen Magrete, the first who appointed him king of Denmark, Norway and Sweden in 1389. But a funny thing is that he had to wait until Magrete died in 1412 before he became the real and ruling monarch. One building from his time stands today as the oldest renaissance castle in Scandinavia, the fortification called Malmö Hus. The construction of it began in 1434. The year 1536 marks the beginning of the Danish reformation (shift from Catholicism to a protestant church) and the Danish king Christian the second had his friend Christian Pedersen along with the mayor of Malmö, Hans Mikkelsen translate the bible from latin to Danish, and a local priest released shortly after the first book of psalms in Danish. As mentioned earlier in the article, Sweden won Malmö and the provinces of Skåne in 1658. One year later a small group of men loyal to the the Danish king tried to start a rebellion to free Skåne and bring it back to Denmark. It failed and 3 of the men was executed at the Malmö center square, the rest of the rebels was exiled. The year 1712 was a problematic year for Malmö as the city was hit by the plague, and within a year almost half of its population died. Better times were though soon to follow. After the end of the Great Nordic War in 1720 a long peace time followed, and Malmö soon started to blossom. In 1775 the construction of the Malmö harbour started, and soon followed a large shipyard. One of the first railroads in Sweden, Malmö to Lund, opened in 1856. And the Swedish workers movement, had its base in Malmö in the 1880’s. 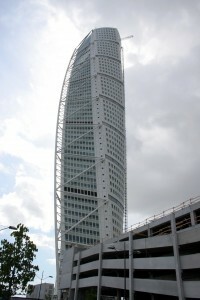 One of the peaks in Malmö’s history was the opening in 2005 of the Turning Torso (see article picture). It was not only the tallest building in Sweden and Scandinavia, but also it’s the second tallest residential building in Europe with its 190 metres. But the biggest peak came 5 years earlier with the opening of the Bridge crossing the Øresund. One could be bold and say that Malmö, after 342 years of seperation came back to Denmark again. Several studies have shown that the population in this part of Sweden would vote for the option of reuniting with Denmark. With the Danish capital being just a short train trip away it is only natural if they feel closer to Denmark than to a Sweden ruled from Stockholm. Unfortunately in the recent years Malmö has earned a reputation, at least in Sweden, as the Swedish answer to Chicago in the 1930s due to its many shootings, and violence between different gangs. But all in all; when you’re in Malmö what you’ll meet going there is a modern international town, and should you want more, Copenhagen is less than 30 minutes away. ← Nika & Eva release the Goodbye Song….and another new single coming soon.